Before I left St Andrews, I got a little spendy in Toppings & Co - otherwise known as the best bookshop ever - and stocked up on some beautiful signed copies. One such book was Release. To be perfectly honest, I picked it up because I fell in love with A Monster Calls. 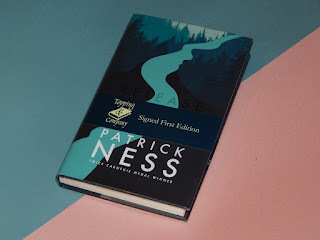 It dug its hooks into my heart so deeply that I knew I wanted to read something else by Patrick Ness. Release seemed as good a place as any to make good on that promise. Release is a microcosm of a book, with the entire narrative centred around one day. It just so happens that on that one day Adam Thorn’s life begins to change and that some things decide that they can’t stay buried any longer. It’s a day of heartbreak and loss - one that Adam will always remember. Adam is a brilliantly vivid and likeable character, that you can’t help but root for. I was on his team from the very beginning, until the novel drew to an unwelcome close. I would have been perfectly happy to continue reading his story far beyond the final page. But I also understand that a big part of the magic of Release is that you feel like you a seeing such a short period of time when everything suddenly gets shaken up. It is a really simple premise but Ness has managed to make something truly wonderful from it. It is obvious that he has complete control of his craft; it takes great skill to pull it off. It is also brilliantly creative, with a healthy sprinkling of magical realism within it. As you probably know, I do enjoy that and Release was no exception to that rule. If you're looking for an engaging and utterly lovely novel about the moment your entire life changes (and how on earth you are meant to deal with that), you should definitely pick up Patrick Ness’ Release and read it.